Alaphilippe brimming with confidence and form with Itzulia Basque Country and Ardennes next on the hit list. Foes and teammates alike tipped their hat to the unstoppable Julian Alaphilippe. The Deceuninck-Quick-Step star led the attack over the Poggio and then out-sprinted an all-star elite group to claim his first career monument in stunning fashion Saturday at Milano-Sanremo. Runner-up Oliver Naesen (Ag2r-La Mondiale) had a front-row seat to Alaphilippe’s exhibition. He described it as a “funny feeling” when he was powerless to change the outcome. Naesen’s comments sum up the feeling from many in Saturday’s 291km trek to open the monument calendar. Alaphilippe came into Sanremo as one of the top favorites, and did not disappoint. After finishing third in 2017, Alaphilippe rode with panache to fend off some of the biggest names in the peloton. After finishing third in a photo-finish in 2017, Alaphilippe made sure he was first this time. 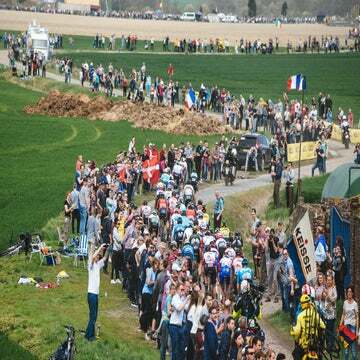 He uncorked a powerful sprint that fended back everyone, including Peter Sagan (Bora-Hansgrohe), who was fourth behind Naesen and Michal Kwiatkowski (Sky). Another rider who could not answer was 2017 winner Kwiatkowski. Hot off third at Paris-Nice, the former world champion was equally awed by Alaphilippe’s impressive kick. “It was another year where the sprinters don’t make it,” said Elia Viviani, who also started as a favorite alongside teammate Alaphilippe. “Everyone was looking at us today, and he [Alaphilippe] was the first to attack. I think he had confidence in his sprint from last week in Tirreno,” said Viviani, who explained he had to step out of his cleats near the base of the Poggio to avoid falling. The victory puts an exclamation point on Alaphilippe’s start to the 2019 season. He’s already won seven races in 22 days of competition. On Saturday, Alaphilippe confirmed his pre-race favorite status with a superb performance that put the entire peloton on notice that Deceuninck-Quick-Step could be unstoppable in the northern classics. The team has already won 19 races across four continents this year, including a sweep of the opening weekend of the Belgian classics and Strade Bianche. Up next for Alaphilippe: Itzulia Basque Country and then straight into the Ardennes. With the way he’s riding now, Alaphilippe could be hitting a few more exclamation points before the spring is over.